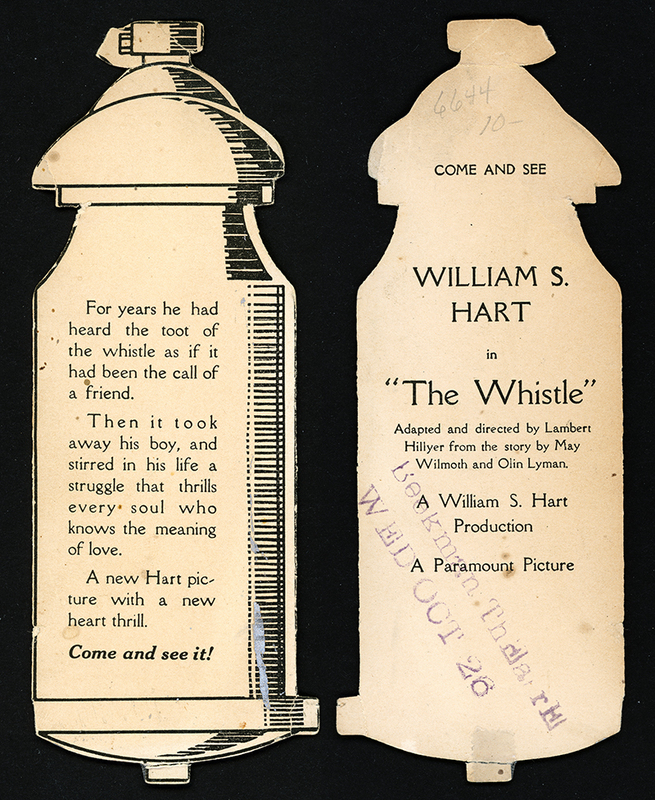 SCVHistory.com LW2816 | William S. Hart | Die-cut Advertising Piece for 'The Whistle' (1921). Die-cut Advertising Piece for "The Whistle"
Die-cut advertising piece for "The Whistle," produced in 1921 by its star, William S. Hart. 2x6 inches, double sided, printed on lightweight card stock and distributed in theaters. One side reads: "For years he had heard the toot of the whistle as if it had been the call of a friend. Then it took away his boy, and stirred in his life a struggle that thrills every soul who knows the meaning of love. A new Hart picture with a new heart thrill. Come and see it!" Other side reads: "Come and see / William S. Hart in 'The Whistle' / Adapted and directed by Lambert Hillyer from the story by May Wilmoth and Olin Lyman. / A William S. Hart Production / A Paramount Picture." LW2816: 9600 dpi jpeg from original advertisement purchased by Leon Worden.